Available in Oriental Blue Burst, Dusk Sun Red, Natural, Black and Vintage Sunburst, the new APX500III is available now. As an electric guitarist in the mid-1980s, if you wanted to play acoustic on stage there were few options for you that really worked - and certainly nothing that was designed with you in mind. 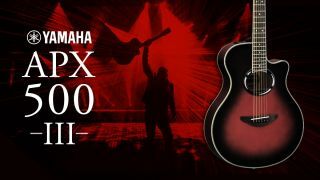 After talking to guitarists playing gigs of all sizes about what they really needed for a stage acoustic, Yamaha decided to make the first acoustic guitar that could be taken from a guitar rack, plugged in and played at volume - problem free. And so APX was born - designed to meet the tonal needs of both the guitarist and the band as a whole. No more howling feedback, misplaced mics or the dreaded extended sound check…. And being designed for electric guitarists, it wasn't just the sound that was the focus on the APX - every element was tweaked to be an easy switch on-stage, from the stylish finishes to the cutaway body and the slim, electric-guitar style neck. In any electro-acoustic, the pickup is at the heart of the sound. The first APX guitars were loaded with basic undersaddle piezo pickups and, over time, as new pickup technologies became available, APX has featured a variety of systems suited to different playing styles and tonal requirements, several of which are still available today. The latest APX500III still features an undersaddle piezo pickup, but things have moved on since those early models and now it's Yamaha's proprietary Pickup-R transducer - the same pickup as featured in the highly acclaimed A Series range and boasting incredible dynamic range, natural tone and the feedback rejection and mix-friendly sound that guitarists need and want. Yamaha's legendary active preamp is still a big feature of APX, and being built by Yamaha's audio-visual division, the sound quality is everything you'd expect from the world's number one. Styles have changed a little since 1987 and, over the years, the APX has continued to adapt to the needs of the guitarist. The essence of APX is the same as ever but, compared to the first models, today's APX guitars boast a more woody, natural look, a 5mm deeper body for better bass response and greater volume and, under the hood, non-scalloped bracing for a responsive, dynamic tone. As an electric guitarist looking for an acoustic option, there are lots of APX look-a-likes out there, but nothing can match the depth of tone, ease of use and value for money - honed over nearly 30 years - that the APX500III can offer. The new APX500III is available now in Oriental Blue Burst, Dusk Sun Red, Natural, Black and Vintage Sunburst. Test it out for yourself at your local Yamaha Dealer. Find out more about Yamaha guitars on YouTube, Facebook, Twitter and Instagram. For your chance to win one of five APX500III click here to enter our competition.